Michael Stelzner, Amy Porterfield & More?" There's a secret UNTAPPED RESOURCE on the internet that's growing by leaps and bounds. Authors, speakers and trainers hang out there. Buyers look there for authority figures. People who market in this area of the internet make sales. What am I talking about? Setting up your very own internet radio show on iTunes, as well as other "podcasting directories" around the internet. Recently -- Showtime, CBS, NBC, BBC, CNBC, ESPN, and Disney have all launched their own "internet podcasts" where their biggest fans and buyers can subscribe to free audio shows on their computer, iPhone, or other smartphone. Traffic, authority, credibility, recognition, and sales! You also don't want to wait a long time to get those things, you don't want to spend a lot of money on it, and you don't want to work too hard to get it. Luckily, podcasting is the PERFECT SOLUTION to get -- and stay -- inside your customers' heads. It takes almost no time or effort to create a new podcast episode -- just a few minutes, when we show you how! You no longer have to write long blog posts, submit hundreds of articles, or sacrifice thousands of hours writing (and editing) a print book. Just click a button, record, save, and upload, and now anyone subscribed to your podcast (or anyone who visits your site) can listen to your latest episode. Pretty cool and simple. How Will You Figure Out...? What's the fastest way to attract new listeners? Let me explain. When I recorded my first podcast, it was actually the wrong length (it's possible for your podcast to last TOO LONG). I hosted it in the wrong place. 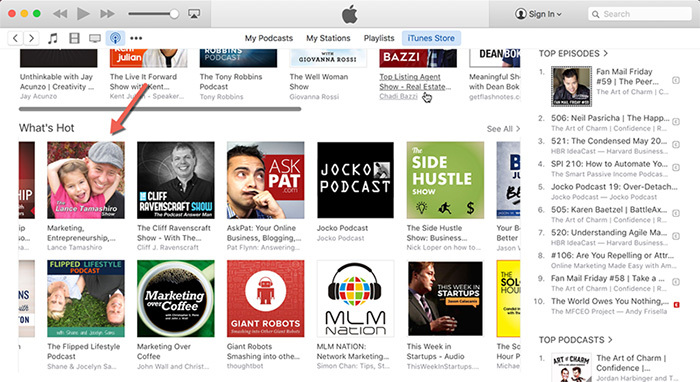 I messed up the various settings so that iTunes did not display the podcast properly. Of iTunes Like I Am? As long as you have a guide who's done it several times before you, perfected it, and can easily show you how to repeat the process any time you want. And Partner With Apple iTunes For Free"
But Easy To Implement System"
I absolutely loved the training. I really need this for my business and as a way to drive traffic. I also know that if I'm to be successful... I have to get VERY COMFORTABLE speaking without that awkward feeling. Thank you very much for showing us an effective, but easy to implement system. I really enjoy the fact that you guys offer information and tools and that you actually expect us to use them. 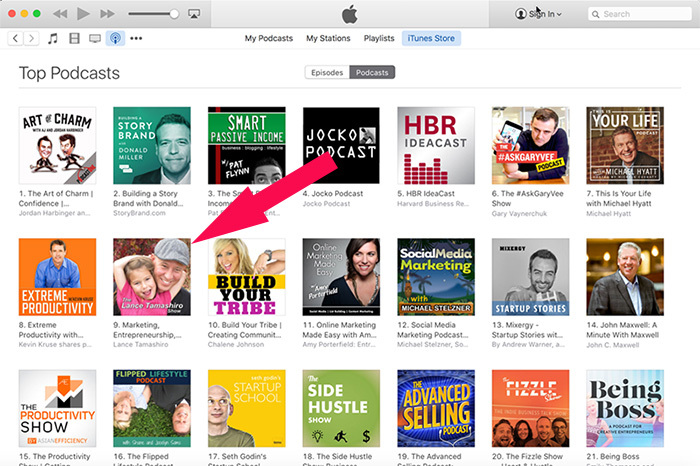 There is really no excuse why anyone cannot have their own podcast as your step-by-step method shows it can be today. Thanks for your over the shoulder approach, you guys are approachable experts and not some out of reach gurus. Thanks for the training I look forward to incorporate it in my business as well as for my personal use, with my children (we are gonna have fun!) and in our ministry. I have really enjoyed the hands on aspect of this training. The step-by-step direction and over-the-shoulder set up has been very good. I also like the challenges. This is a great way to commit to taking action. Putting it on the site publicly is great accountability. Thank you for the in depth training. "I Sincerely Give It 5 Stars!" Podcast Crusher is the bomb!! There has not been a class with this much step by step instruction in a long time! Robert and Lance not only tell you exactly how to build your credibility and following with your own podcast show, but they show you all the ins and outs of setting it up quick and easy. Watch them do it, then take action and do it yourself! I love all the extra hints and ideas to really stand out so you are not just another "me too." The training on getting subscriber engagement was super helpful and I am ready to dive in and take action. This course is a must and a no-brainer for any entrepreneur, no matter what the niche. The content and the community support at Podcast Crusher is really outstanding! I sincerely give it 5 stars! Thank you Robert! Thank you Lance! "I Finally Have All The Pieces Together"
Flat out amazing with great direction! Take action with these guys and you will not fail. I finally have all the pieces together to start my Podcast and with Podcast Crusher I will do it the right way the first time. "I'm Always Impressed By Your Trainings"
AMAZING as usual! You guys absolutely rock! I'm always impressed by your trainings. Always worth every penny. Would totally recommend to anyone who wants to build their expert platform. What I love most: the specificity telling us what we'll be doing on each module the tools that will be needed showing us step-by-step. Actually doing as we watch reviewing what we just learned and then tying each new module to those already done having us commit to action by action & when they will be done... brilliant! "I Will Save Loads Of Time By Having A Plan"
I appreciate the amount of training provided today. Extremely valuable and quite the bargain. I will need to gather all the tools and get busy producing. I know have all the info needed to produce a quality podcast and also will save loads of time by having a plan. Recording, uploading, submitting: all laid out in simple, fast and easy to understand directions -- technical issues are no longer a problem! See the start to finish process as we setup a REAL internet podcast right in front of you, to follow along! "Never Received So Much Value"
I sincerely tell you that I have NEVER received so much value from any purchase I have made on-line. You guys have over-delivered by a factor of at least 1000. 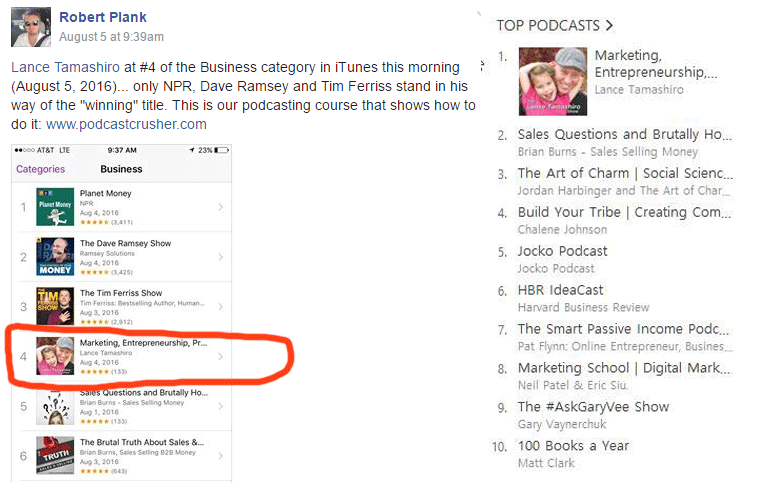 Produce a Professional Podcast, Rank for Any Keyword, Product, or Authority Figure in iTunes and Google Just As Soon As You Submit Your "Next Episode"
You've created an amazing, high value course, rich in its multi-dimensionality and immediate practical usefulness. Complete in every sense: rationale, tools & equipment, set-up and leveraging for optimal exposure in multiple marketing channels and monetization. While I kept up with more than I expected during the rapid-fire course because of the clear directions and demonstrations, it should be straightforward to go back & follow the videos. Even for a non-techie like me. So easy, we'll create and publish episode #2 together, while we're waiting for iTunes approval! "You've Made It Easy For An Average Person"
Robert and Lance, this course is unbelievable! Thank you for your generosity in sharing this incredibly valuable training with us. You've taken a big scary topic (podcasting technology and strategies) and made it easy for an average person to get a podcast submitted to iTunes within an hour of beginning your course. "Now I Have The Complete Plan!" This training was outstanding! I've wanted to get into podcasting for a while and never really could figure out how to go about it. Now I have the complete plan! Thanks so much, Lance and Robert! Most people who create podcasts are audio nerds -- don't be one of them, you'll make more money! Crank out episode after episode, no one really listens, no real feedback, it's just "a hobby"
Make sure people listen and that you're delivering what they want, not just what you "think" they want! "You Guys Overdelivered On This Product!" This was an awesome, hand-on, step-by-step, actionable, A to Z training. No detail was left out. Not only did you tell what to do, but you then demonstrated it so that no one would be left to try to figure any step on their own. I can honestly say, if action is not taken on this information, it's simply because the info was not put into action. This is my first training with you guys but you now have a fan for life. Totally overdelivered and I feel confident that I can confidently move forward in starting my own podcast. You guys overdelivered on this product. You got a follower for life from me. Awesome stuff!! You'll also have a way to automatically build your audience and make money from that audience -- so you'll want to (easily) create more and more episodes! Top Secret "Podcast Traffic Exchange"
If you can't setup your online radio show or podcast, within the next 30 days, I demand you fire me from your business and you get your refund. Just contact us and we'll send your money back immediately. Click the button below and you'll be sent to a PayPal checkout screen, where you can either choose "Pay with my PayPal account" or "Pay with an online banking account, debit or credit card." After your successful payment, you'll be sent to a registration page where you'll have instant, 24 hour a day lifetime access to the Podcast Crusher training materials. P.S. Podcast Crusher is a single payment membership site. You will need the ability to play videos on your browser (free and included with most browsers). P.P.S. After signing up, your account will be instantly activated and you will have access to all training videos in the next few minutes.